This plug-in helps you calculate the print size of your photos at various resolutions and determine the optimal size of your prints. 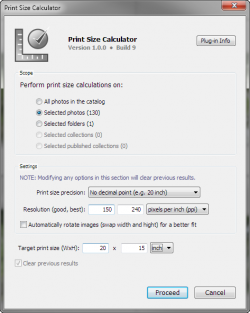 How bad will my photos turn out if I print them at this size? What is the best print size for my photos photos? Which of my photos can I print at this size? How well these photos match the print format I chose? How large my photos need to be in order to print well at this size? These are just few common problems the plugin can solve! The original idea of this plugin was suggested my Mr. Thomas Kemnitz (www.thomaskemnitz.de) when he was looking for a tool to optimize the layouts for his photo books. The unregistered version has no functionality restrictions. You may use the unregistered version at no charge for 10 days. After the trial period you will be required to purchase your personal registration code to continue using the plugin. Improved calculation of aspect ratio values - now they are rounded to the nearest tenth instead of being rounded down. Fixed the link to the plugin's home page. The Target Size field has been replaced with two separate fields - Target Width and Target Height. Added new fields: "Width at Target Height" and "Height at Target Width". Now fields in the Library Filter are sorted alphabetically. Metadata fields renamed for clarity: "Fit" to "Fit Level", "Dimensions" to "Cropped Dimensions", "Need Dimensions" in sections Good Resolution and Best Resolution to "Dimensions at Good Res" and "Dimensions at Best Res" respectively. Improved the consistency of default field values.